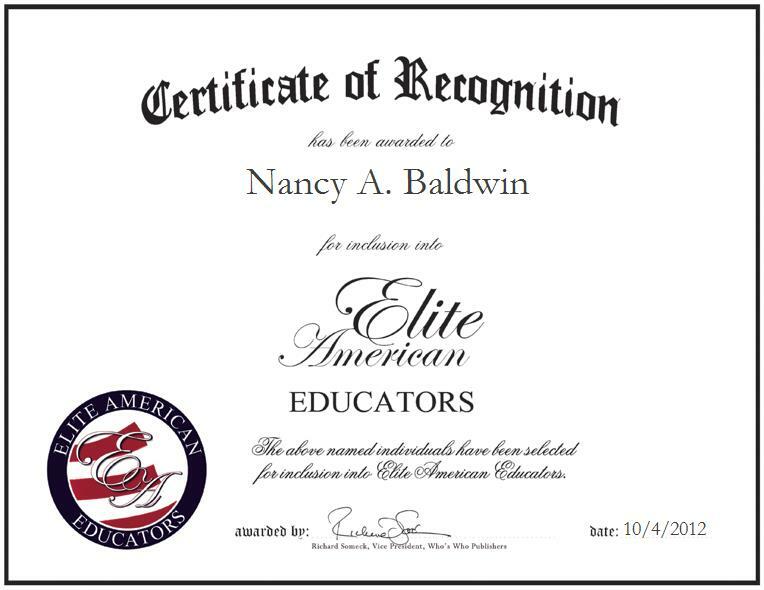 SOMERVILLE, MA, October 4, 2012, Nancy A. Baldwin, Teacher for an Employer-Sponsored Child Care Company, has been recognized by Elite American Educators for dedication, achievements, and leadership in early childhood education. At her current post, Ms. Baldwin makes the most of her expertise in collaborating with parents and children in efforts to ensure that the children she oversees grow to become successful adults. She is primarily in charge of feeding infants, conducting art projects and singing time, and encouraging babies to reach for items and giving each tot a massage at the child care center that provides care for children between the ages of six weeks and 15 months. She tailors her services according to parents’ schedules in efforts to shape solutions that accommodate families, and reads to the infants in order to support early learning, and stimulate each young child’s sense of wonder. Ms. Baldwin has nurtured an ever-growing skill set over the course of a career that has spanned more than 13 years, and she continues to strive for excellence in her endeavors. She attributes her success to continuously learning new things and keeping abreast of all current child care issues. Ms. Baldwin has been accredited as a Certified Infant and Toddler Teacher at the Bunker Hill Community College. She pursued her current teaching position after managing a home day care in Maine. Ms. Baldwin thoroughly enjoys working with infants and children, and instilling in them the poise and self-assurance needed to reach their individual potential and prepare to learn on an ongoing basis. Teaching has been her life’s work. She has previously run a home daycare service, and also served as a nanny; in addition, Ms. Baldwin has worked for a Respite Care Service through the State of Maine with autistic children.